Hello... thanks for visiting me today. I had a few minutes to play the other day and I went to one of my favourite sets... Sheltering Tree. I was out in my garden looking at my trees with all their shades of green. I decided to recreate them with this fabulous stamp set. 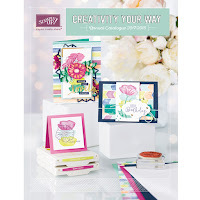 It is super easy to create lovely cards in no time with this great set. I used Early Espresso ink to stamp the tree trunks and branches. For the leaves I used Cucumber Crush, Old Olive and Mossy Meadow with variations of straight stamping and stamping off to get more dimension with the varying colour tones. I added some of the blades of grass with Mossy Meadow ink. I added a bicycle and swing to finish off the scene for my card. I'm so glad this set stuck around, it's pretty awesome! I hope you like my share, have a great weekend... see you on Monday!